Home » ★★★☆☆ » Ham Yard, Soho. I have lived in London for more years than I care to remember, but I have never before been to Ham Yard, slap, tickle and bang in the middle of Soho. Ham Yard was placed firmly on the Soho tourist map by the opening of the Ham Yard Hotel, part of the Firmdale Group. I want to pretend to be a tourist for a weekend, just so that I can stay there and drink in its gorgeous bar, slob about in its luxurious spa and appropriate some interesting interior design ideas. I don’t think I’ll be eating at the restaurant though. It has taken me a while to get to Ham Yard, because I’ve been put off by the mixed reviews every time my fingers hover over the Opentable booking page. It is not often that I am lost for words and that didn’t happen here, but I use a few which I don’t get to take out regularly, such as stunning and gorgeous and I wish my house looked like this and I want to redecorate now. We are placed in restaurant Siberia, at the back, away from the main drag and below a skylight which casts too bright a light on the proceedings. I mention the Siberia thing but no-one laughs. I cannot complain, as we have landed a fourth guest on them at short notice and I should just be grateful, but this little corner feels like it has been detached from the main restaurant and is not brimming over with atmosphere. Tip: ask for a table in the central group of tables. The graciousness shown at reception extends to the rest of the service. Special mention should go to the manager, who is particularly patient whilst we are faffing about with a Bourgogne Aligoté and an unoaked Chardonnay, neither of which do the business for us. We end up with something Spanish, Bolo Godello, which I would never have chosen, knowing little about Spanish wines. Having the sort of spicy floral richness that we are looking for, it is spot on. We only have the three bottles. 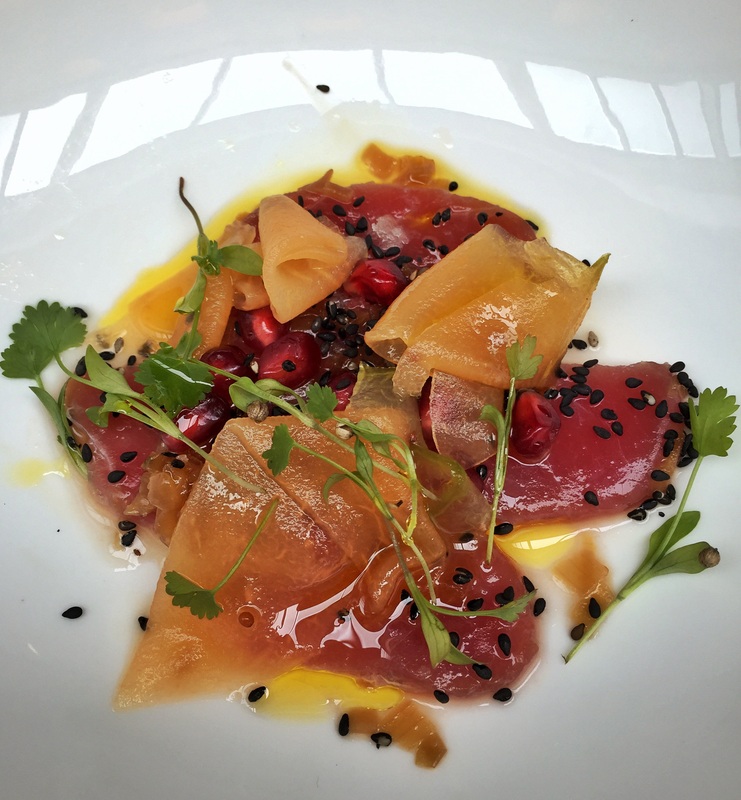 The menu is in the modern seasonal British-with-a-twist category and I choose very non-British tuna ceviche, cucumber, melon, pomegranate and black sesame seeds. A good-sized portion of marinated tuna in a semi-sweet dressing, there are slices of floppy, flavourless melon draped over it. It is not great, but neither is it a fortune at £9. 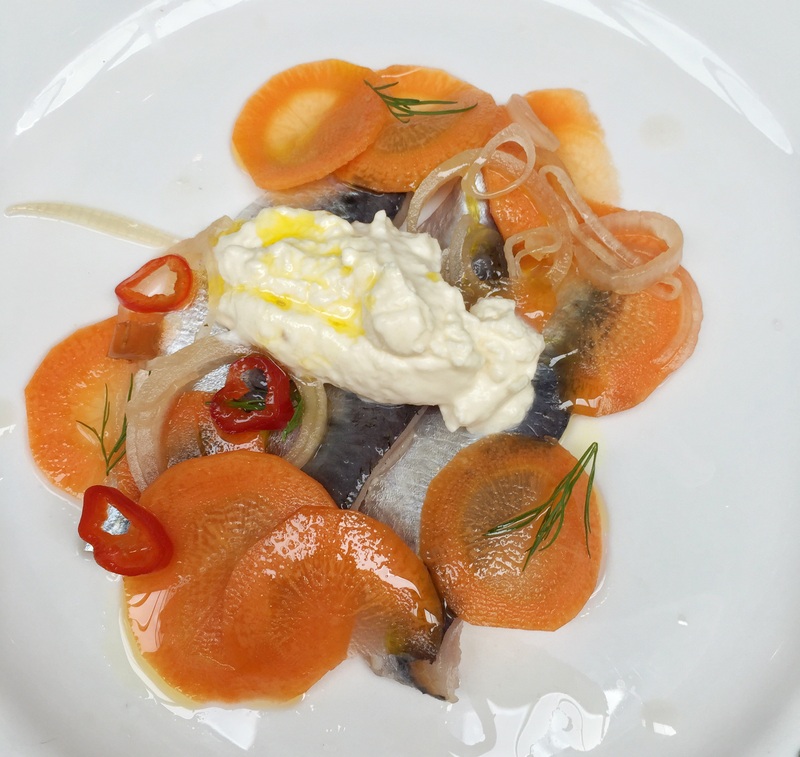 I look with anticipation at N’s dish of pickled sardines “escabeche” and horseradish crème fraîche. A sweet-and-sour combo, the horseradish and pickled onions are the highlight. The menu might have mentioned the carrots and chilli, given that they are such an integral part of the dish, the carrots covering much of the plate. If I didn’t like carrots I’d have been disappointed at their abundance. A bargain at £8. Things start to look down with the main courses. 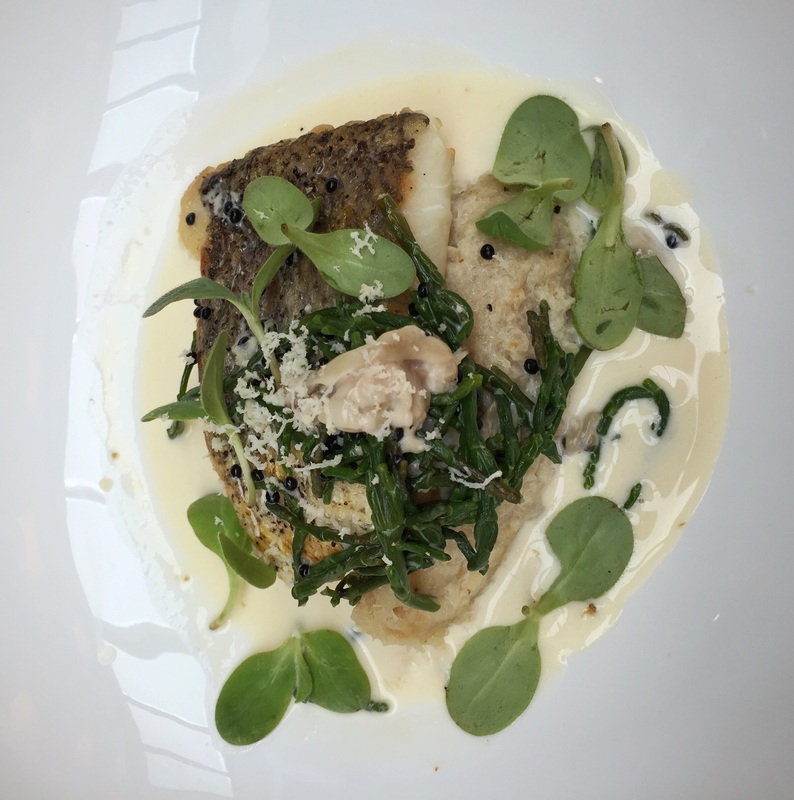 Cornish hake, celeriac, oyster velouté, borage and horseradish promises some heat from the horseradish, you’d imagine. 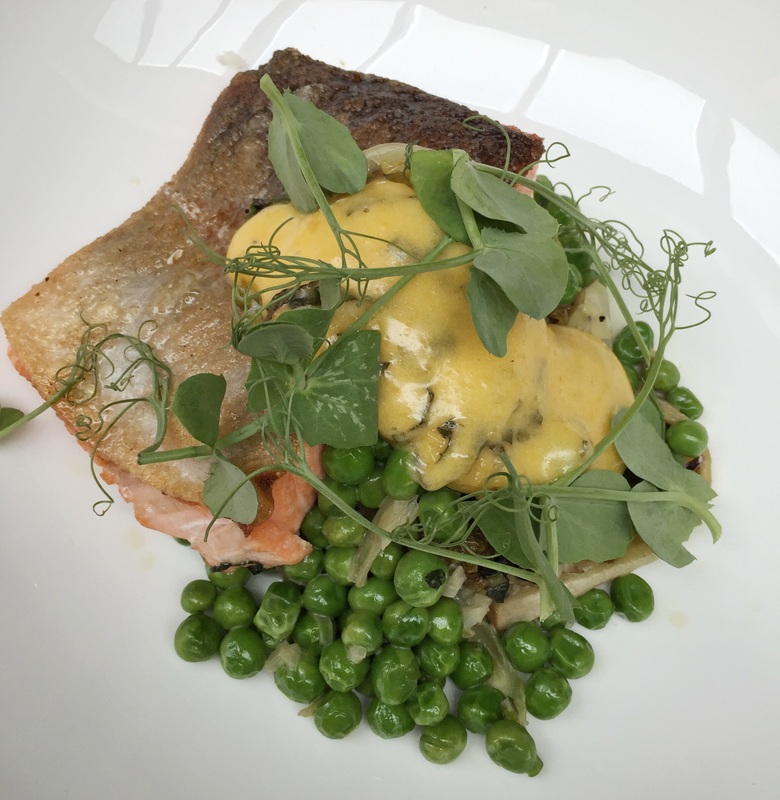 It comes with some unadvertised samphire, a welcome addition, given that the rest of the dish is rather lacking in punch. If there is any horseradish, it is of a variety that has no heat at all. The mashed celeriac is on the grey spectrum and has a slightly bitter tang. The skin of the fish is gooey. No-one asks why I leave over half of it. I would have said. 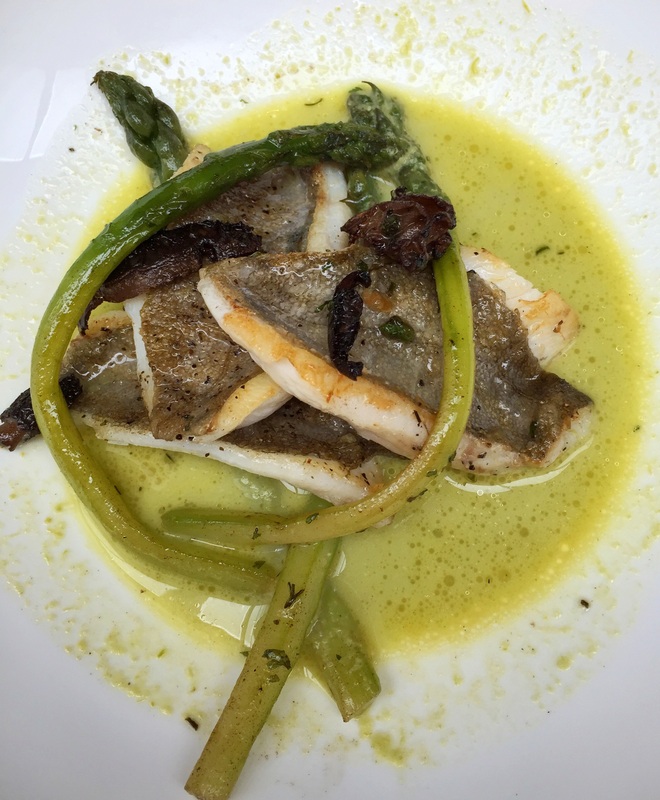 A portion of John Dory is also a disappointment, overcooked and rubbery. In a liquid which appears to contain puréed asparagus and oily bubbles floating in it, there is a rim of green detritus where the liquid has left a residue and looking at my pictures, there appear to be your bog standard white mushrooms on the dish and only the one that might be a morel. N was the only happy camper, very pleased with his sea trout, the only criticism the fish skin, lacking any sort of crust. We discuss the possibility of cheese and there is an extended discussion with the waiter about the merits of individual plates over a shared board. After much debate of the type engendered by three bottles of wine, we go for a board and ask for lots of celery. 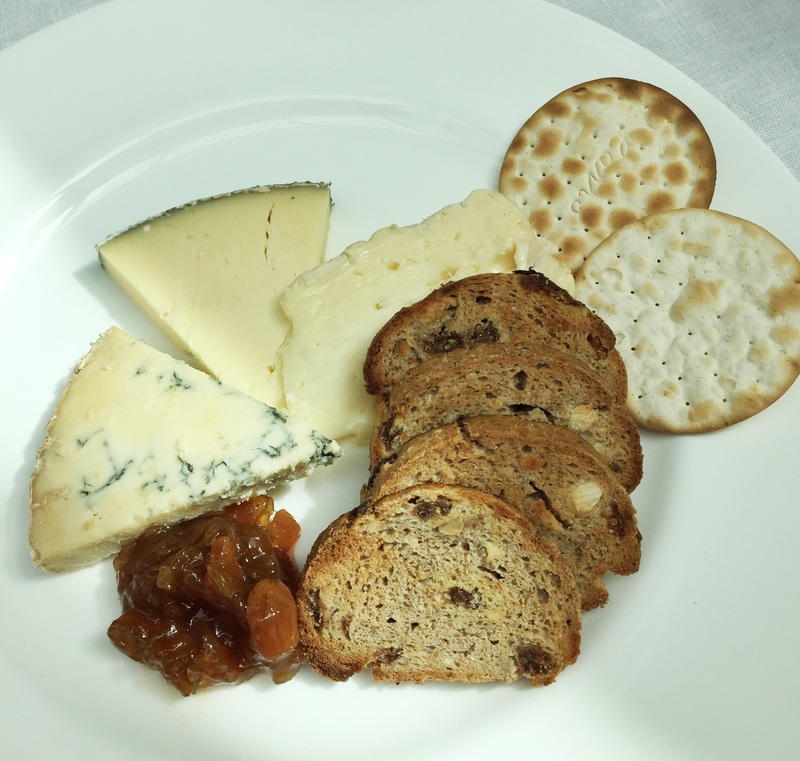 They bring three individual plates of decent cheese and fruit and nut toast. We have to ask for more celery. The Verdict: Ham Yard promises more than it delivers. Great service is let down by mediocre food and whilst the prices are reasonable, they appear less so when the quality of the food is not up to the mark and certainly not up to the surroundings. There’s a reason those reviews were mixed and I’m of the same mind: great place, so-so food. If the food was executed to the same standard as the décor this could be a great destination.